Carry a fully-charged cell phone. There's no better insurance when you're miles away from help, home or your car. You should strive to be fairly self-sufficient. A tire patch kit, spare tube, mini-pump and some basic bike tools come in handy in emergencies or for quick adjustments on the fly. Give your bike a quick inspection before hitting the trail by checking tire pressure, brakes, shifting gears, etc. And try out that new micro tire pump (or other unfamiliar gadgets) before you ride. You may find that your new pump is set up for a different tire valve type than the one on your bike! Carry a water bottle or two, preferably the insulated type for those scorching summer days. They may cost a few dollars more, but they keep liquids cooler longer. When possible, add some ice to make the chill last longer yet. The days of awkward, uncomfortable head protection are long gone. The technology from racing helmets has long since trickled down to the consumer market. The bike helmets of today are lightweight, comfortable and well vented. There is no downside to wearing one. So what's your excuse for not protecting the most important part of your body? If you tend to deliberately park your car at one end of a trail before heading out to ride, listen up. This practice can give you the feeling of setting off on an adventure and not seeing your gas-guzzler until your long journey is over. A nice concept, but not very practical. Should you have a major mechanical failure or accident at the opposite end of the trail, you may find yourself at the furthest possible point away from your car. Instead, park near the middle of a bikeway when decent parking is available. This provides the added benefit of cycling past your vehicle at least once during your ride -- if you're riding the entire trail -- allowing you to grab more sustenance when necessary (you did bring food and water, right?). Finding a safe trail parking area can also be an issue in some cases. Checkout these safety tips. To avoid mishaps with other users on the trail, always ride defensively. If you ride the roads or have ever ridden a motorcycle, you know the drill: Expect the unexpected. On the trail that can be dogs darting in front of your wheel, toddlers roaming the trail as you approach, cyclists stopping in front of you without warning, rollerbladers kicking a leg into your path or spokes, etc. If you slow down when you approach traffic and prepare yourself for Murphy's law to take effect, you'll be fine. Or "Passing on your left," if you prefer, is a safe way to give a shout out to warn trail users that you are approaching and about to pass. This technique can take a little practice if you don't have a strong voice. Call out too early and you won't always be heard. Give a shout too late and you'll startle the folks you were politely trying to warn. Or, simply use a bike bell as your signal. Be Careful at Road Crossings! For impatient cyclists trying to religiously maintain a certain pace or heart rate, road crossings can be viewed as a bothersome, unpleasant interruption during a great workout. Get used to it. There are road and/or driveway crossings on virtually every trail. That's the bad news. The good news is that learning to respect all crossings will go a long way toward ensuring you'll be around to enjoy these bikeways for years to come. Though crossings are usually well marked for cyclists, the type of road you're approaching is usually a mystery until you're right on top of it. It may be a deserted lane or a busy county highway. Important! Some trails are not rigorously maintained to keep brush and weed growth from compromising sightlines at these crossings. This added danger should not be taken lightly. Blowing through stop signs can result in serious injury or death. Be prepared to stop at each road, driveway, parking lot or sidewalk crossing. 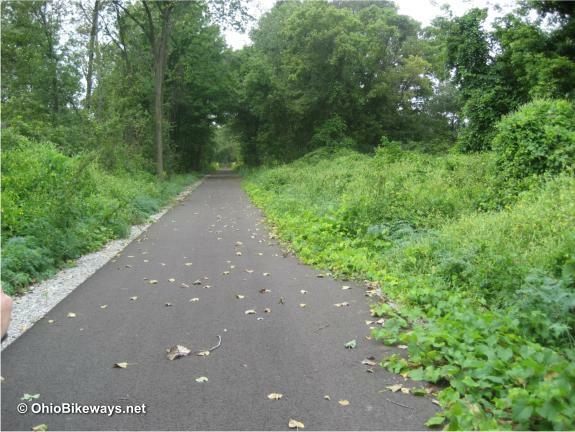 Most Ohio bikeways are multi-use trails that allow many different types of users to enjoy these pathways. This can result in heavier usage in some areas, particularly on weekends during summer months. This shouldn't be a problem for cyclists who enjoy a leisurely pace, but for those who ride faster, avoid areas prone to prime time congestion unless you're willing to navigate a maze of cycling families, rollerbladers, dog walkers, etc. If you can't avoid those areas, try riding during the early morning hours or late in the day. Despite a few crazy trail traffic concepts out there, such as "Walk Left -- Ride Right," staying to your right when trail traveling is the proper way to go. Faster travelers will overtake slower movers by passing on their left: joggers pass walkers, bladers pass joggers and cyclists pass bladers and so on. Obviously there can be a lot of passing on congested bikeway sections. Be patient and don't crowd out oncoming traffic by passing too hurriedly. Side by side trails, like the Holmes County Trail, can be a bit trickier. They provide one surface for buggies and horses, and another for bikes. But the two sections are sometimes flip-flopped which can lead to the bike trail being on the right, then crossing over to the left hand-side while you're still riding in the same direction. Read the trail signs regarding proper usage, then when in doubt, simply slow down when you approach others and stay over to the farthest right-hand edge of the trail. That way, even if you happen to be on the wrong trail, you're still moving with the flow of traffic. Keep in mind that rules will vary from trail to trail. The following is a generic set of trail rules for example purposes only. For specific rules for a particular trail, check with the trail managers. Here are some tips on how to reach them. Only non-motorized forms of transportation are permitted, however, motorized wheelchairs are ok.
Bicyclists should yield to all other users. Announce passing to other users. Pass with caution. Move off trail surface when stopped. Please yield to law enforcement, maintenance and emergency vehicles. Respect private property and stay on the trail. Dogs must be on short leash. Curb and scoop after your pet. Drugs & alcohol are not permitted.